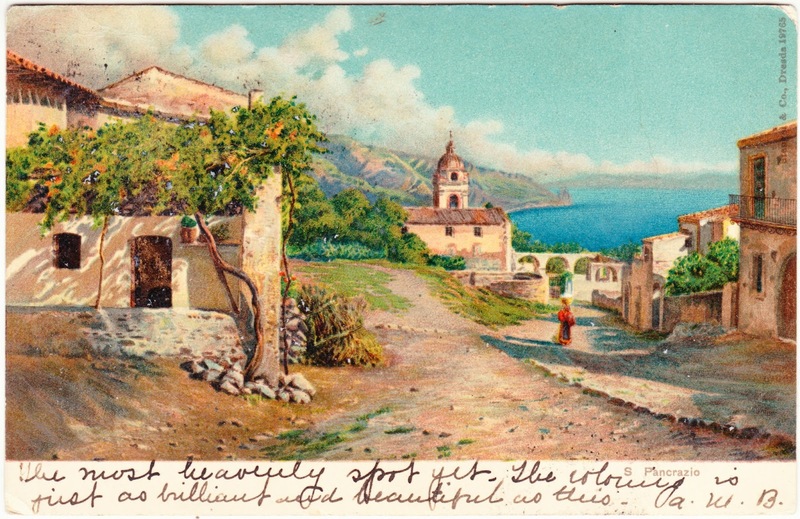 Papergreat: Taormina, Italy postcard: "The most heavenly spot"
Taormina, Italy postcard: "The most heavenly spot"
This turn-of-the-century postcard shows a scene from Taormina, an Italian municipality of about 11,000 residents (today) located on the eastern coast of the island of Sicily. It has long been, as you might imagine, a popular tourist destination. It's also a hot spot for writers — such D.H. Lawrence, Jean Cocteau, Halldór Laxness and Truman Capote — who are seeking solitude and inspiration. Shown in this illustration is Strada san Pancrazio (strada meaning, roughly, "street"). 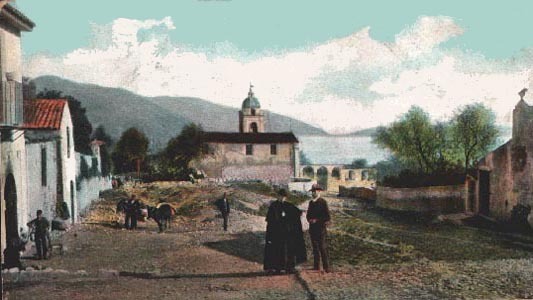 That's the San Pancrazio Church in the distance, in the center of the postcard. San Pancrazio (Pancras) is the town's patron saint. Here's similar view of Strada san Pancrazio from Wikipedia. "The most heavenly spot yet. The coloring is just as brilliant and beautiful as this. A.W.B."